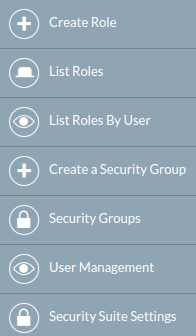 Roles and Security Group settings are managed from the Users section of the Administration Panel. The settings allows you to restrict access to sensitive data in SuiteCRM to specific teams (groups). There are many options to allow you to configure it to your exact needs, and a number of automatic assignment options to ensure that your users can always access the data that they need. Security Groups allow you to define groups of users with particular access rights defined by the roles attached to the group. Groups can also be used to assign records to teams of users. Roles are used to define access rights to modules and determine what a user can do with a record once they have access to it. There are 3 key steps to setting up Groups so that you work correctly. Create a group for each team of users and add the appropriate users to the group. Create a role and select the appropriate access levels. Assign that role to each group. Add the groups to records in your SuiteCRM instance. You can use the Mass Assign on the List View to do this. Going forward the groups will automatically inherit based on your SecuritySuite Settings. You can also use logic hooks, workflow, or do a direct database insert into the securitygroups_records table if doing a one-time initial setup. Create a role to define access to modules and the functions users will be able to perform on records within these modules. The role can then be assigned to security groups or to individual users where appropriate. Select Role Management, and then Create Role from the Role Management sidebar. Once the role has been created, the role matrix will be displayed, showing all the configurable access options for each module. Click on a cell to change the access setting. Note that you can change the setting for an entire column by clicking on the column heading. Users will not be able to view records for this module. Gives users access to all records assigned to members of the same group. Gives users access only to their own records. Users will not have access to this function for this module. Click SAVE Once saved, access rights are color coded for ease of reading. If your users should only typically see their own records then the role you would assign to their group would be configured to have Owner rights. A manager who is a part of the same group, but who should be able to see all records in the group should have a role directly assigned to their user record that gives Group access. Assign the role to a group or an individual user as appropriate, using the subpanels below the matrix. Select List Roles from the sidebar to view all roles and their descriptions. Click on the role name to view and edit the access settings. Click on the pencil icon to edit the role name and/or description. Select a username from the list to display the access matrix for the user as defined by all roles applied to the user. 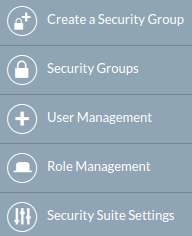 Select Security Suite Management from the Admin panel to view any existing groups or create a new group. Create a group to define groups of users with particular access rights which are defined by the roles attached to the group. 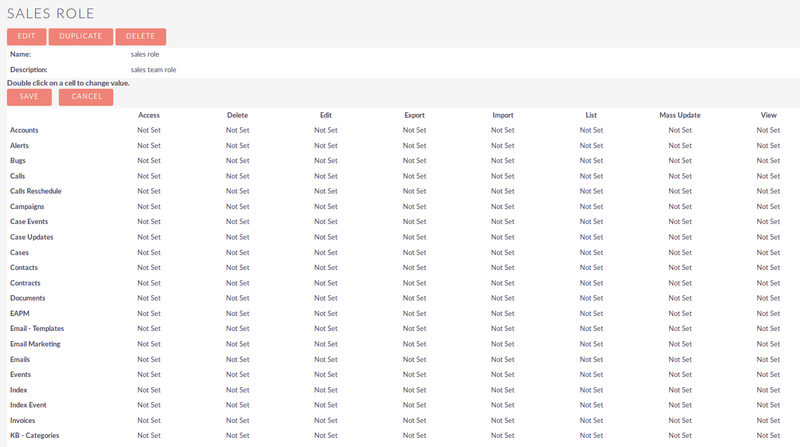 Groups can also be used to assign records in the CRM. Select Security Suite Management, and then Create a Security Group from the sidebar. Enter a name and an optional description for the group. Not Inheritable If this field is checked then the group will not automatically be attached to any record. This can be useful for cases such as creating groups to assign roles to. The Detail view for the newly created group will appear. Add users and roles to the group as required, using the subpanels. Here, Chris and Sarah are members of the group and the Owner Only role has been applied, so the Owner Only role settings will apply to both Chris and Sarah. Select Security Groups from the sidebar to view all security groups. Click the group name to edit the users and roles attached to the group, and the pencil icon to edit the group name and/or description. SuiteCRM System Administrators can configure many advanced options for Security Suite. This allows you to control various access rights, inheriting of records, filters and more. If a user is a member of several groups only the respective rights from the group assigned to the current record are used. If any role is assigned directly to a user that role should take precedence over any group roles. Adds a panel to a record creation screen if a user is a member of more than one inheritable group that allows a user to select one or more groups (that the user belongs to) that should be associated with the newly created record. If a user is in just one group the normal inheritance rules will instead be applied. The new record will still inherit from the Assigned To user or Parent record if these options are set. This setting only overrides the Created By setting. The record will inherit all the groups assigned to the user who created it. The record will inherit all the groups of the user assigned to the record. Other groups assigned to the record will NOT be removed. E.g. If a case is created for a contact the case will inherit the groups associated with the contact. Locks down inbound email accounts in the email client to only list those that belong to the same group as the current user. Set groups that should always be attached when a specific module record is created, e.g. you can set a group to be assigned to all newly created Account records.